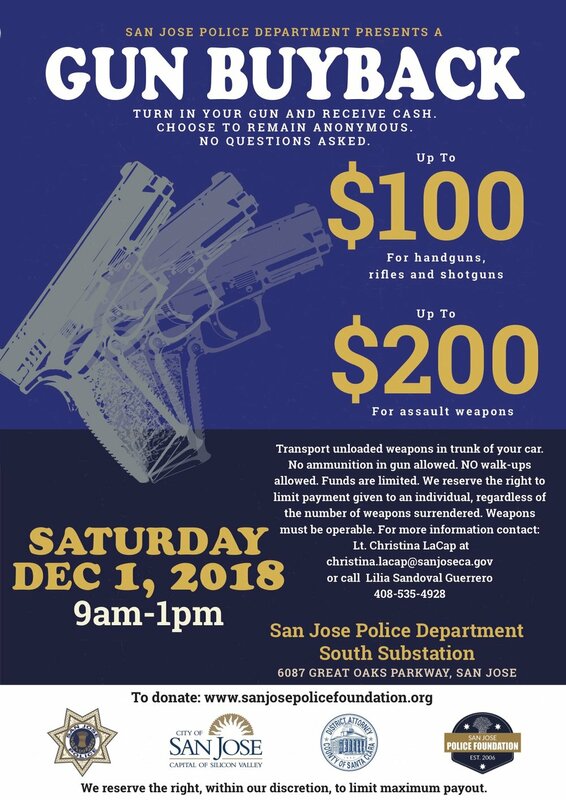 In an effort to reduce gun violence and prevent suicide, the San Jose Police Department, in partnership with the City of San Jose and the San Jose Police Foundation, will hold a Gun Buy Back event on Dec. 1, 2018. You can donate here to support San Jose’s Gun Buy Back event. The primary purpose of our Gun Buy Back event is to take up to 600 guns out of circulation. By removing guns from homes where they are not properly secured, we will ensure that they are not stolen and used in a crime or accessible to someone with suicidal thoughts. Silicon Valley Community Foundation, District Attorney of Santa Clara County, San Jose Museum of Quilts & Textiles and San Jose City Council members. Please help us reach our goal to raise $100,000 to support the Gun Buy Back by donating here. All funds raised will be used to buy back guns. The guns that are purchased will be destroyed.